Figure 2.22. Rana pipiens. 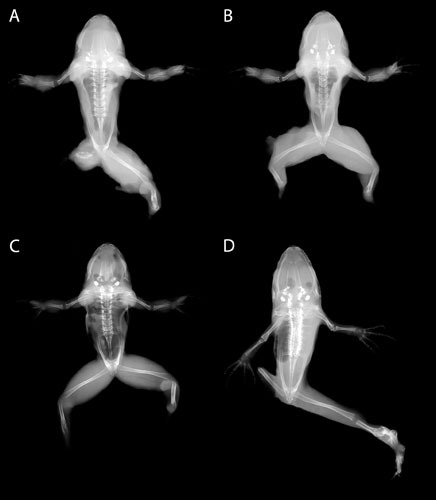 Additional examples of bilateral ectromelia in northern leopard frogs. A, B and C were found in Dan Sutherland’s Trempealeau County, Wisconsin, site in 1998; D was collected from ROI on 3 August 1998 by Minnesota Pollution Control Agency field biologists. A) 32 mm SUL; B) 33 mm SUL; C) 33 mm SUL; D) 33 mm SUL. From Lannoo, M.J. 2008. Malformed Frogs; Copyright University of California Press.